Psychz Networks Review 2019: Is Psychz Networks a Good Hosting? Psychz Networks offers solid dedicated server options with 2Gbps DDoS protection and 1 Tbps internet connectivity. Servers offer customizable features and are perfect for most any website or network of websites, including gaming websites. Psychz Networks is a U.S. company that initially started as a shared hosting provider but evolved into a provider of specialized services that include colocation, private cloud, and CDN services. For those looking for hosting services, their dedicated servers offer experts total freedom in designing their website or a network of websites on powerful servers with 1 Tbps internet connectivity. Since their inception in 2001, they’ve been the web hosting vendor of choice for over 10,000 clients. Psychz Networks owns and operates two data centers located in Dallas, Texas, and Ashburn, Virginia. Additionally, they’ve also partnered with data centers around the world to offer their users single-CPU Xeon servers in places such as London, Amsterdam, Johannesburg, Mumbai, Tokyo, and Taipei. 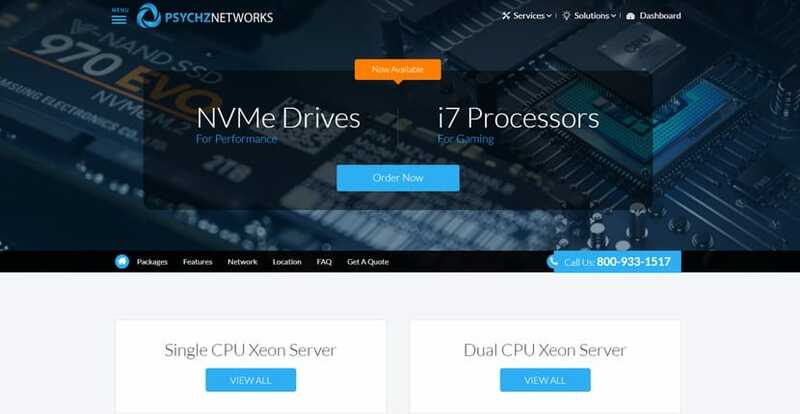 If you’re looking to host a gaming server, Psychz Networks now offers i7 processors for gaming along with NVMe drives for increased performance. If you require managed hosting of your servers, that option is available for an additional fee. Dedicated servers are not for beginners, and you’re responsible for setting up everything on the server unless you choose a managed hosting option. Beginners should look for a provider that offers shared hosting. Experts should have no problem using this product, as it includes multiple tracking and administrative features such as DDoS attack tracking, port traffic graphs, and more. Psychz Networks offers multiple options for setting up your dedicated server. They offer you the option of running a Single CPU Xeon Server or Dual CPU Xeon Server. Each server comes with multiple configuration options offering massive storage, memory, from four to eight CPU cores, and more. You can further customize those options to suit your needs. Does one configuration offer 24GB of memory even though you need 48GB? You can pay a little more to upgrade the RAM. There are too many options to list in this review, so check out the website for more information on their available servers. Psychz Networks offers standard support for this type of service, providing online ticketing support and a fairly standard knowledge base. If you ever do encounter an issue, Psychz Networks promises a 30-minute response time on support tickets. You’re expected to know what you’re doing, so they aren’t going to offer much support outside of problems that arise from their servers directly. If you don’t have much experience managing a dedicated server, then this is not for you. If you’re looking for a dedicated server with customizable features or one that offers managed hosting, look no further than Psychz Networks. They provide secure servers with 2Gbps DDoS protection, fast internet connectivity, and hardware that can handle most any traffic load you can throw at it. Wondering how Psychz Networks stacks up against other Web Hosting companies? Enter any other Web Hosting company and we will give you a side-by-side comparison.